I love macaroni and cheese. What better way to make it than to spice it up on the charcoal grill! 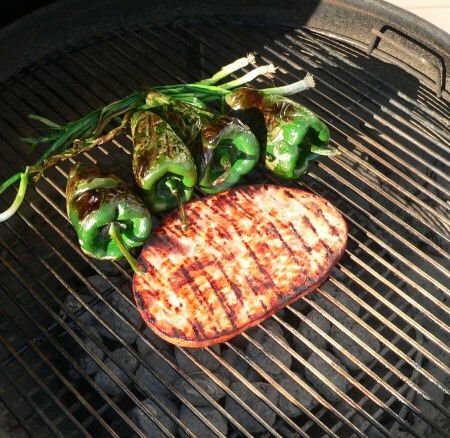 This recipe utilizes grilled poblano peppers and grilled ham steak. White cheeses are used so the color of the ham and chili peppers really shines through. This is a favorite of mine as it is both cheesy and spicy. What a combo. 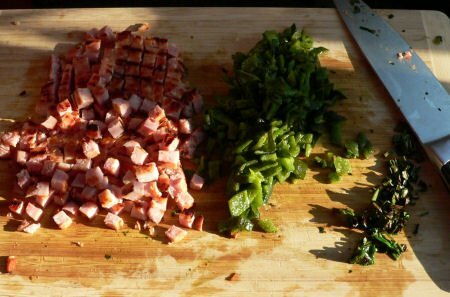 The first step is to coat your poblano peppers, green onions, and ham with olive oil. Place them over medium direct heat (about 350 degrees). Grill the peppers, onions, and ham for about 10 minutes, rotating the peppers every 3-4 minutes. After the ham, green onions, and peppers were nicely charred, I brought them inside and removed the skin from the poblano peppers. The charred skin should fall right off so you shouldn’t have a problem here. If it doesn’t fall right off put it in a sealed container for a few minutes. The steam will help loosen the skin. I then diced everything into small pieces. After you are finished chopping your peppers, ham and onions, its time to start making the cheese sauce. In a large saucepan over medium heat, melt the butter. As it starts to sizzle, whisk the flour into the butter to form a paste. Cook this mixture until it starts to brown. This will take about 3 to 4 minutes. Stir often! Add the milk while whisking to keep lumps from forming. Raise the heat to medium-high. Gradually add 3 cups of the Monterey Jack cheese and the white cheddar cheese (keeping 1 cup of jack cheese behind for later), all the parmesan cheese, the salt, dried mustard, chili powder, cayenne pepper, and the white pepper. 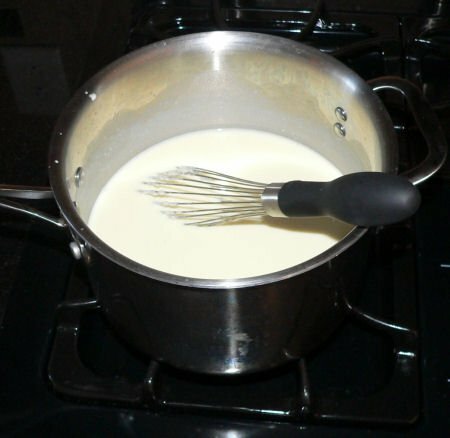 As the cheese melts into the sauce and it begins to boil, lower the heat to a simmer. Cook for 4 to 5 minutes. Remove the cheese sauce from the heat and pour into a buttered 2 1/2- to 3-quart baking dish. Make sure the sauce has thickened significantly before you remove it from the heat. 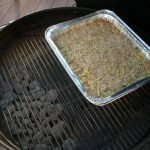 I used an aluminum throw away baking dish. Meanwhile, cook the macaroni according to the package and drain. Add the cheese sauce to the baking dish and then add in the cooked macaroni. Then mix in your grilled peppers, ham and onions and mix thoroughly. Sprinkle the bread crumbs over the top of the dish along with the leftover cheese. To be crazy you can melt another 4 T of butter in a bowl and pour in 1 cup of panko bread crumbs. Mix up the bread crumbs and sprinkle evenly on top of the cheese. Finally, get your grill ready for a medium indirect heat. This is about 350 degrees. 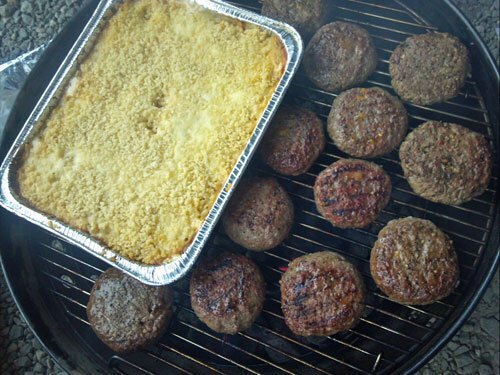 Add the baking dish to the grill and keep the lid closed as much as possible. If you are pressed for time you can always keep moving the baking dish over direct heat. This is what I do at tailgates. Moving the dish over direct heat will get it bubbling quite quickly but you have the risk of burning the macaroni and cheese. So I advise keeping it over indirect heat for as long as possible to cook it. After thirty minutes your mac n cheese should look like the above picture! Note: I’ve done this recipe quite some time now and if you are crunched for time you can skip the grilled poblano peppers. In place of the grilled peppers buy about 3 cans of the little chopped green chili peppers in the Mexican section of most grocery stores. This really cuts down on the prep time. For a tailgate I’ll bake the macaroni and cheese at home in my oven and then reheat it at the stadium parking lot. As you can see from the above cell phone photo I’m still making this dish. This picture is from a Sept 2012 tailgate. 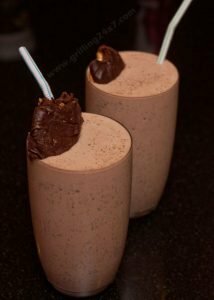 It really works well along side of my stuffed cheeseburger recipe. 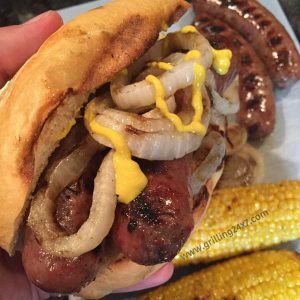 Note – I believe this recipe came from a Weber e-mail that I got a few years back. 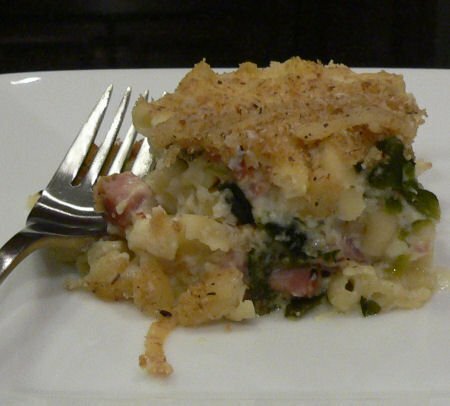 A spicy grilled macaroni and cheese recipe with grilled ham. Finally, get your grill ready for a medium indirect heat. This is about 350 degrees. 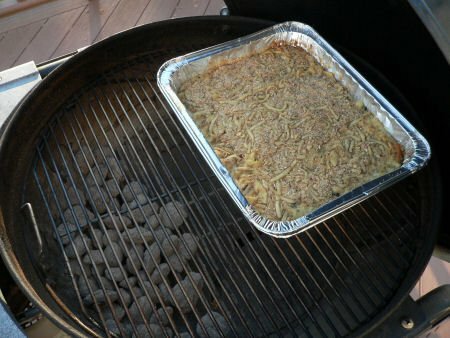 Add the baking dish to the grill and keep the lid closed as much as possible. If you are pressed for time you can always keep moving the baking dish over direct heat. This is what I do at tailgates. Moving the dish over direct heat will get it bubbling quite quickly but you have the risk of burning the macaroni and cheese. So I advise keeping it over indirect heat for as long as possible to cook it. About 30 min or so.